​Looking for a versatile travel system that can keep up with the changes of a growing baby? Then the Cortina CX Travel System from Chicco might be a good choice. Wondering what it has to offer? Read through my complete review of this travel solution and find out just why it might make a worthy investment. ​Pros: Highly versatile, comes with a variety of features to accommodate every kind of user. Cons: Bulky and heavy, stroller frame might feel flimsy. Summary: Affordable travel system that can adapt easily to you and your baby’s needs, but its weight and the quality of the stroller frame might take a toll on overall satisfaction. 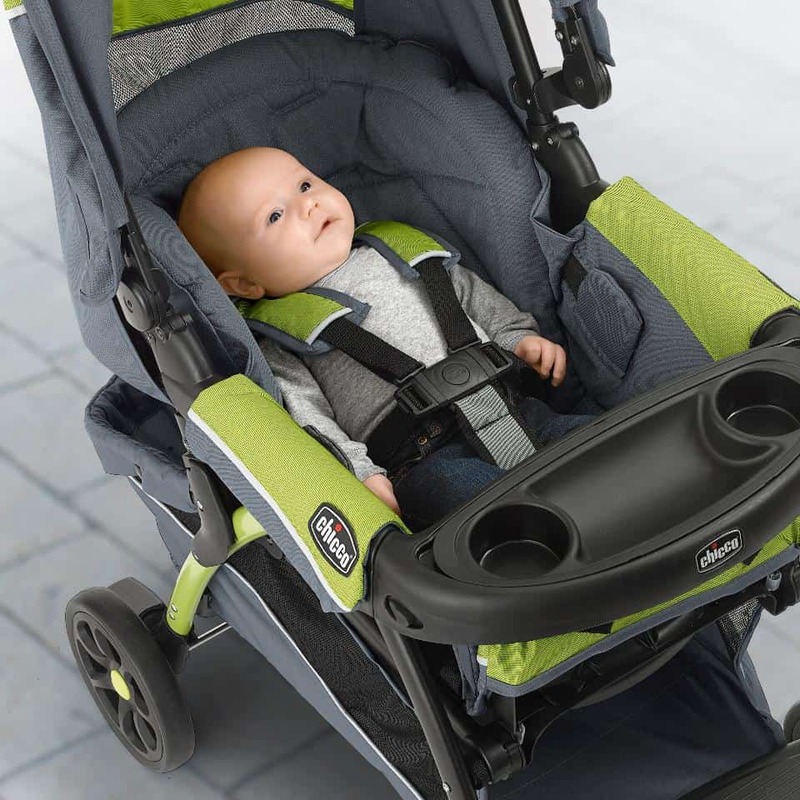 The Cortina CX Travel System claims to be one of the most full-featured stroller and car seat combinations available. The design comes from Chicco – the leading brand in baby gear and essentials. 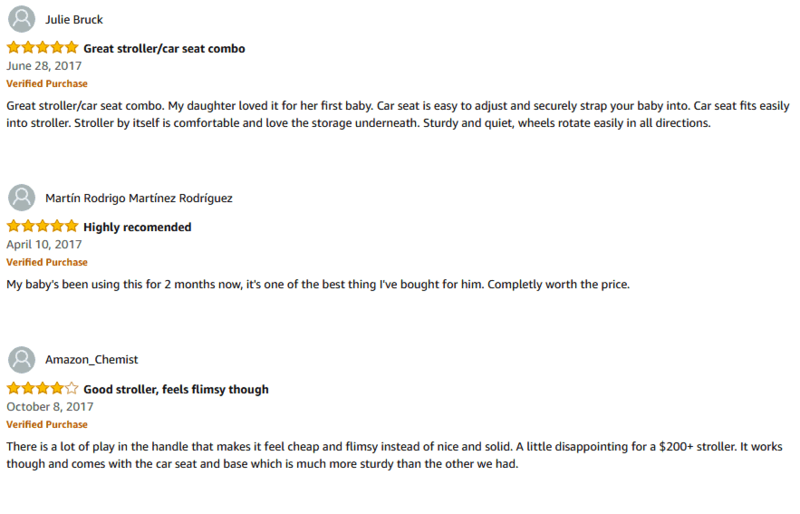 Checkout our reviews on Best Car Seats Stroller Combo. The Cortina CX is equipped with a number of features that allow it to adjust to your baby’s changing needs. The design also keeps parents in mind, providing a number of convenient functions that allow greater ease-of-use. Highly versatile design can easily adapt to meet your baby’s growth and development. Lots of parent-centered features to give you greater convenience and more freedom. 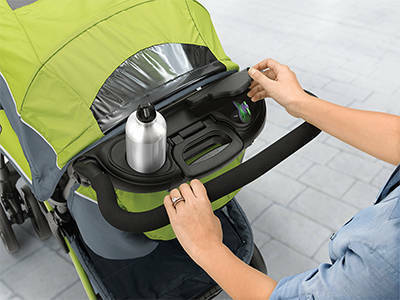 Fast locking and release system lets you transition your baby to and from your car quickly and easily. The bulky and heavy design might not be too easy to lug around, especially for smaller parents. Flimsy stroller frame might feel cheap and easily breakable. Doesn’t come with any sort of suspension system, so it’s not too great on uneven terrain. Probably one of the design’s main selling points is its versatility. With this particular design, Chicco made sure to offer users a wealth of different features that make the system ideal for growing babies. It’s also quite efficient for parents who want to be able to bring less baggage by providing several built-in features that keep all of your essentials within hand’s reach. Along the handle, parents have access to their own parent tray, which features a cup holder and a covered compartment that can easily fit a phone, a wallet, or other essentials you might want to keep close. Beneath the seat, a spacious storage basket can accommodate items like diapers, clothes, bottles, and larger items you would usually store in a nappy bag. I found the under seat basket to be quite convenient, especially if you don’t want to have to bring another bag with you for all of your baby’s essentials. For your baby, the stroller features a feeding tray with two cup holders and a specially designed safety liner that’s dishwasher safe. This makes it a whole lot easier to clean, especially because big bulky food trays are likely to get all smudged with food when you have a messy toddler. As for your baby’s growth, the stroller and car seat system can accommodate infants as light as 4 pounds, to children that weigh up to 30 pounds. So you can expect to use the system for a while, perhaps until your baby reaches his terrible twos. Comfort-wise, the system features plush, soft padding that’s just the right density to keep your baby comfortable for extended hours of use. I do want to point out though that the thick foam stuffing can insulate quite a bit of heat, so you may want to consider looking up ways to keep your baby cool in the system during use. The seat can recline to 8 different angles and can achieve a full recline for little babies who have yet to establish neck control. I also find it to be perfect for sleeping toddlers, as the full recline setting tends to reduce any pressure on the neck during movement. Other than that, everything else is pretty much compliant with industry standards. The seat comes with a five-point safety harness, optional cushion liners for smaller babies, and a car seat design that conforms with international safety standards. Ease-of-use on the parents’ end is also pretty impressive. The stroller frame features toe-tap parking brakes which help bring the entire system to a halt with just one light push. Maneuverability is seamless and trouble-free, as the front wheels swivel without a hitch, even when you max out the entire system’s weight capacity. But I do want to mention that although the company does say that the stroller comes with a front wheel suspension, it can hardly be felt on rough terrain. So it would be best to take it slowly on uneven surfaces, as pushing faster could cause some jarring movements that could be potentially dangerous to your baby. One of the things that most parents look for in a travel system is speed of transitions. This entails easy, preferably one-handed folding, locking, and release mechanisms that reduce the time and effort spent trying to move your car seat to your stroller and vice versa. The Cortina CX features a one-handed release system that easily unlocks the car seat from its base in your vehicle. Securing it to the stroller frame is as simple as clicking the locks in place. I thought this was one of the design’s best features, as it really does help take away from that taxing transfer process. Folding the frame and putting it away can also be pretty simple and easy. Much like the release feature, collapsing the stroller can be done with a dedicated one-handed mechanism. Personally, I can see this coming in handy when you have your baby in one hand, and there’s no one around to help you collapse the system to put in your car. Perhaps the only real problem I found is the fact that it might be a little on the heavy side. Smaller parents might struggle to manage and handle the whole thing since it is so bulky and large. But other than that, the overall design really does improve convenience. I did a little extra digging to find out what real users have to say about the Corina CX from Chicco. Majority of users have no complaints with the design and those that do often mention just the stroller frame and the weight of the design. If you’re not completely sold on the Cortina CX from Chicco, there are a few other choices on the market that might better suit your fancy. The Smooth Ride Travel System from Safety 1st could make a great choice if you’re looking for versatility and affordability. This design comes at a much lower cost and features some of the same convenient functionality that the Cortina CX has. Soft and comfortable seating for newborns to toddlers. Lots of spacious compartments, including a dedicated parent tray. Fast folding mechanism lets you collapse the stroller with one hand. You can learn more about the Smooth Ride Travel System here. Another choice you may want to check out is the Evenflo Vive Travel System. 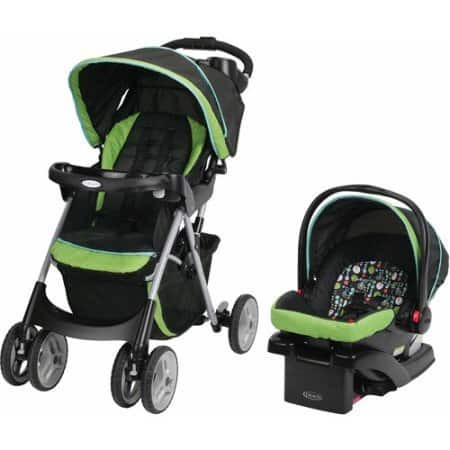 This stroller and car seat combination comes with an even easier price tag and adapts easily to a growing baby. 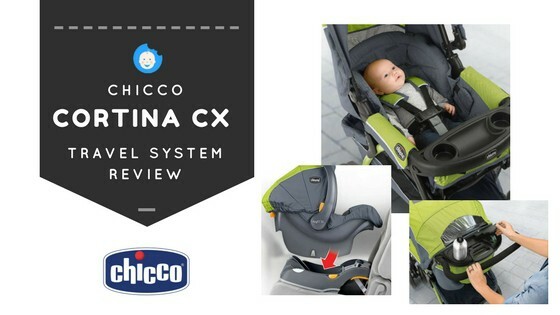 In terms of the features that it offers though, I want to mention that it isn’t quite as versatile as the Chicco Cortina CX, but it’s not so bad. Ultra-slim 16 inch fold, perfect for storing in small car trunks or storage spaces. Comes equipped with a mobile phone holder and an under seat basket for your own essentials. Lightweight compared to other heavier and bulkier designs. If you want to know more about Evenflo’s Vive Travel System, you can see it here. 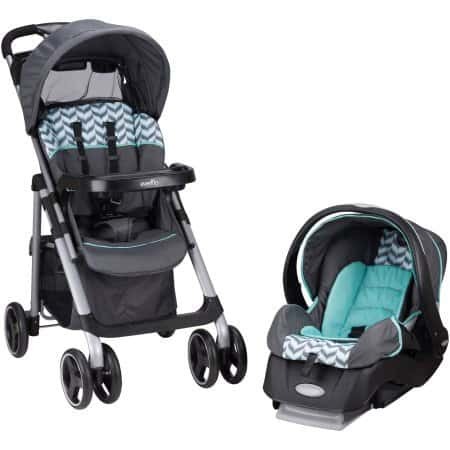 Another full-featured travel system you might have already come across in your search for the right choice for your needs is the Graco Cruiser Click Connect Travel System. 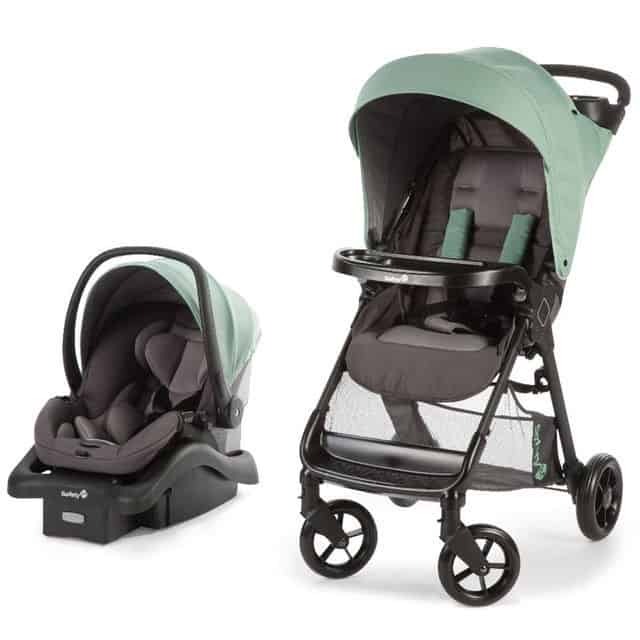 This stroller and car seat tandem was designed to be extra comfortable for your baby and comes with a wealth of features that help make it a convenient choice for most parents. Comfortable, plush padding keeps your baby fuss-free for longer. 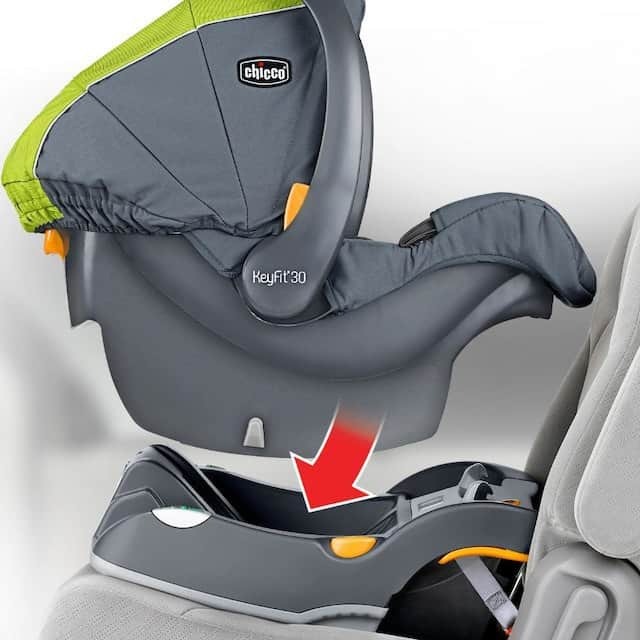 Click Connect mechanism makes locking and releasing the car seat from the stroller frame easy and secure. 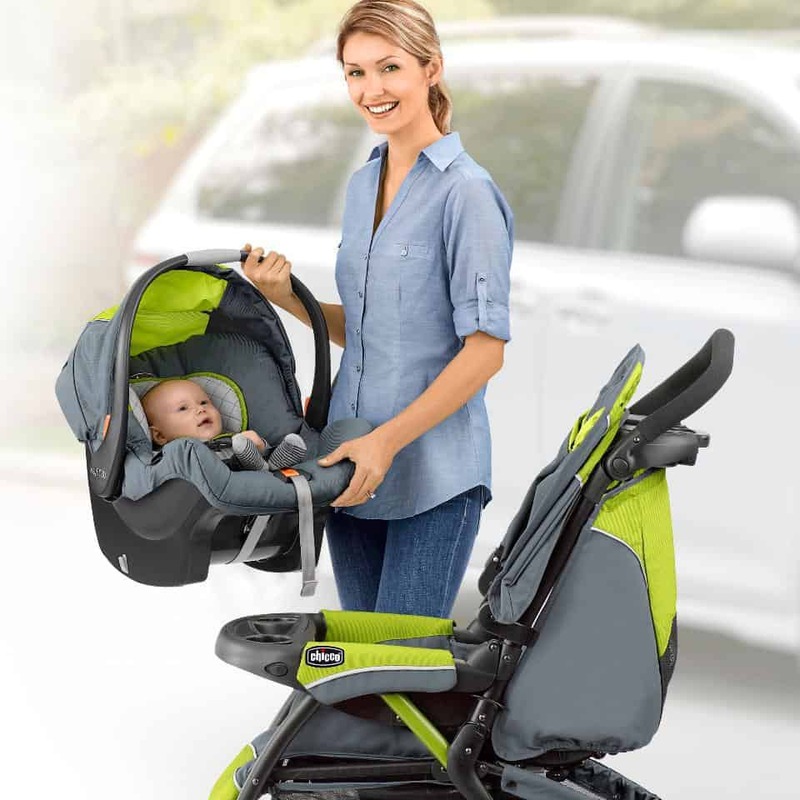 The built-in suspension is responsive and reliable, giving your baby a smooth, hitch-free ride. Want to know more about this travel system from Graco? Find it here. Life won’t stop and wait for you – even when there’s a newborn baby in your arms. So, make sure you have the right gear to get those errands done with ease and safety by having a reliable travel system in your arsenal. Find the right one for your needs and preferences by checking out the choices I’ve listed above – I promise they won’t disappoint!